This weekend was the annual community-wide yard sale in my neighborhood. I’ve lived here almost three years but for some reason I had never gone. It’s a big to-do, and more than anything it was a reminder of what I love about living in Charleston. There were more people milling around my neighborhood than I’ve ever seen. Yard sale shopping is fun but the best part was being out in the community and talking to my neighbors. I was looking for bicycle stuff — a basket, headlights, etc. — but I ended up buying a bike. A man was selling a bunch of these old, vintage bikes and I got the last one. The rest he sold to some collector. It’s a Roadmaster Discoverer. The only thing I know about them is what I found on the Wikipedia page. It seems to be in OK shape. I’m looking forward to restoring it. The tires have dry rot and will need to be replaced. I’m also gonna try to take the rust off of it. 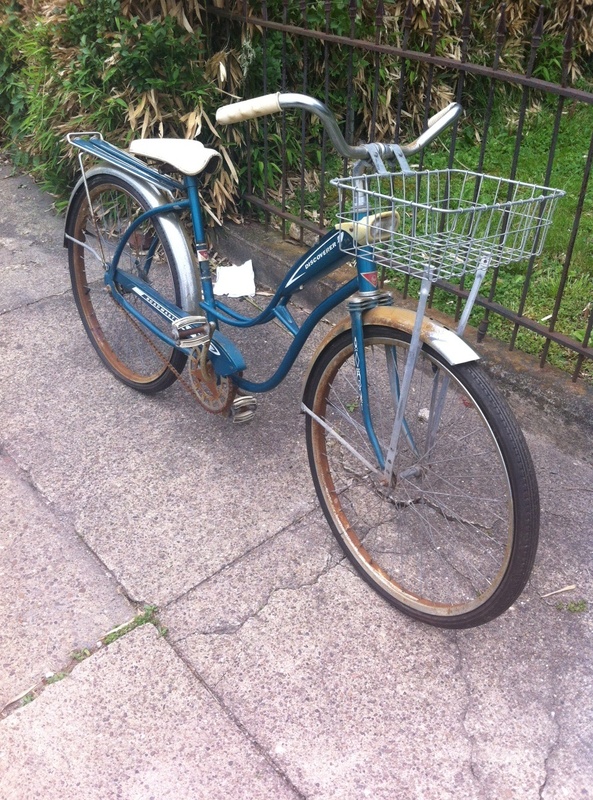 If you know anything about the bikes, or restoring old bikes, let me know. I’m open to suggestions (read: I don’t know what I’m doing). Hi Lori! Congrats on your find! I had one as a kid and I’ve been looking for one to restore as well. A friend of mine recommended turtle wax chrome polish and rust remover to take the rust off. It might not all come off with that but it will help a bunch. You can find it at Walmart or auto parts stores. Good luck to you!